Railroadfan.com • View topic - CSX Pullman, MI Derailment, March 16, 1998. CSX Pullman, MI Derailment, March 16, 1998. Grand Rapids Press article from March 17, 1998. Thumbnails will link to the photo gallery for readable images. on 102ND ST. road. The incident occurred in/near PULLMAN city. The TRUCK had been traveling in an easternly direction at 005 Mph. The railroad was operating on main line track over a public road crossing. stopped then proceeded. There was 1 occupant(s) in the vehicle. The view of the track was not obstructed. There were 1 death(s) and 1 injuries in this incident. A Railroad Injury/Illness Report (form FRA-55a) was also filed. The railroad was transporting hazardous material. A Rail Equipment Accident Report (form FRA 6180-54) was also filed. WESTBOUND TRUCK ON 102ND AVE. DROVE INTO THE PATH ON NORTHBOUND TRAIN AT FLASHER CROSSING. Re: CSX Pullman, MI Derailment, March 16, 1998. The whole area is still showing some signs of the derailment. Shoulda looked for some souvenirs when I was there! The new Lee signals would be toast if this happened today. It is right about where the locomotives are in the picture. 20-30 trains a day? Holy crap! So this guy who lived east of the crossing. Are we to believe he was awaken by the sound of the crash and was able to run down there and "watch the cars come to a halt"? Yeah, right...that sounds really far fetched. I think some embellishing was going on. The TRUCK had been traveling in an easterly direction at 005 Mph. Was the truck heading east or west? It mentions heading west twice in the article. Last edited by J T on Sun Jan 07, 2018 10:32 pm, edited 1 time in total. I can't believe the code line was not hit despite the log-jam of freight cars. "...and I was in the front and Matt grabbed and pulled my ears from behind me and made horsey sounds." I can't remember from those days how many trains went through, but as a kid, it seemed like the parade was non stop at times. Lots of CP traffic, plus, most of the container trains were single stacks or piggy stacks, due to the tunnel clearances. Didn't they used to single stack anything doubled in Detroit coming from Chicago? So they ran lots of extras it seems to get more traffic across the line. CSX also had all of its trackage in possession, so locals and long distance locals were a plenty. Last edited by pudgy on Wed Apr 10, 2013 10:18 pm, edited 1 time in total. Chrisracer8903 wrote: I can't believe the code line was not hit despite the log-jam of freight cars. If the cars were more double stacked, it probably would have taken it down. But most of the containers were single layers out of Chicago. I'm pretty sure it was before the tunnel clearances in Detroit that made double stacks accessible. I want to say that anything double stacked at that time eastbound was either delivered to Detroit (Oak Yard? Livernois?) or single stacked into the empty flats for the trip through to Windsor. By the time I found out about it, you couldn't get much farther than 102nd ave, as the road was blocked off north of there, so I parked at the little store there at the jog in the road and walked up the hill near the 102nd ave crossing and took this pic. Last edited by Jochs on Thu Apr 11, 2013 5:23 pm, edited 1 time in total. Not much "scenery", but I wonder if a certain photographer will be snapping a few pics here soon? I remember that one well. I was in the hotel in Chicago when the word came down that X502 had clobbered a salt truck just north of Grand Junction. No trains would be running anytime soon and the re routes had already started. I was expecting a cab ride home but was called for a wreck train out of Barr yard. As usual, everything was in total melt down mode. Nobody knew anything, but we had to get going asap. We got our power, found some ballast cars that looked like they haven't moved in years and proceeded out to Curtis to wait for panel track coming out of Garrett. The BoB job finally got there and the cars where picked up and tested. Of course these were the days when things were already plugged up and our hot train was laughed at by the Conrail to get to our side. Park It CSX. I got trains to run! LOng story short, we finally arrived at Grand Jct. and put the train away in the pass. 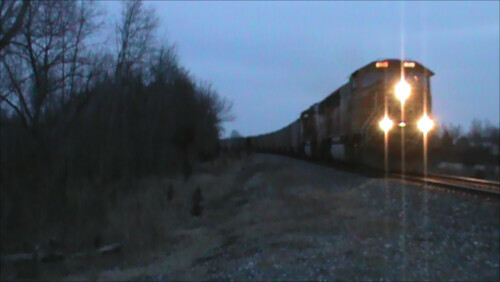 Then was told to go up to the wreck site with the power and pull back what we could of the train to the siding. When we arrived, the place was lite up like a football field. That area is usually pretty dark, but not that night. What a mess. Stack cars out across the street, containers out in the pucker brush and twisted metal everywhere. If I remember right, it was a good day and a half before the track was repaired enough to get trains through there again and a 25mph slow order was on for a good long time to. CP 5410 was the unlucky unit to take the hit along with a rent a wreck Helm unit. The crew survived, although a little banged up, the driver of the truck obviously didn't fare so well. The curve took on a new name for a long time. I wont post it here because it refer's to the engineer on that train. I don't know if anyone calls it that anymore.